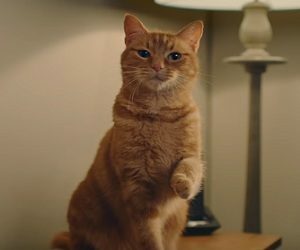 We’ve seen Mooses (the boxer) several times talking to New-Yorker Charlie, his owner, in the adverts released by ClearScore so far, but now there’s also a ginger cat. The latest ClearScore ad introduces Flearoy, who tries to dissaude his owner (Mick, from Hull – a city in the East Riding of Yorkshire) from checking his credit score and report on ClearScore website. The 30-second spot features Flearoy’s owners in bed, before going to sleep, talking about ClearScore after seeing a TV ad about it. “You can actually check your credit score and report for free?”, asks rhetorically the man, who’s holding a tablet. “Er, I know. ClearScore.com”, answers his wife, who’s holding instead a cup with Flearoy’s face on it. The man visits the website to check his credit score and learns he’s got 466 out of 700. “Wat dis?”, asks Flearoy, sitting on the nightstand. “Not now, Flearoy. I’m checking my credit score”, says his owner. “No, not in my haus!”, says back Flearoy, summoning him to “put de cat video on”. Seeing his pet’s though attitude and his paw raised, the man fulfills his wish in no time. The advert ends with the company’s tagline on the screen, “Your credit score. For free. Forever”.